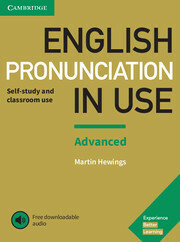 This book, with over four hours of free downloadable audio, includes 60 units of explanations, examples, practice exercises and answers for advanced level (C1-C2) learners of English. You will become confident with all areas of English pronunciation, including individual sounds, word stress, connected speech and intonation, and can practise with simple 'listen and repeat' activities, modelled with a British English accent. Inside the book is a code for the free audio, along with clear instructions for downloading from the cambridge.org website. Perfect for both self-study and classroom activities. 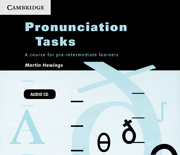 Interactive CD-ROM offers games, exercises and animated diagrams of the mouth, showing learners how to produce individual sounds. Students can also record themselves and compare their pronunciation with one of the many models provided. Audio recordings in a variety of accents provide lots of valuable practice with reception and production of sounds. Handy reference section includes language-specific study notes, a glossary of specialised terms and a focus on minimal pairs.